As it had been cloudy and sometimes rainny in these days we couldn’t do it. But actually we could set up "Koinobori" at last yeseterday. Anyway I am showing a picture of today’s beach….. 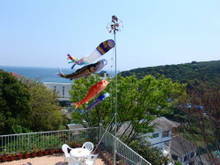 This entry was posted in beach, Family, japanese custom, tradition on 2007年4月28日 by izusakuraya. The weather forcast makes …. … us happy, but sometimes unhappy. When we have guests for our pension I always worry about the weather, because everybody want to play with sun, right ? Actually the weather forcast says it will be sunny tomorrow and the day after tomorrow. This is a picture which I took in Shirahama last April. This entry was posted in beach on 2007年4月25日 by izusakuraya. Good Wave for Surfing in Shirahama !! 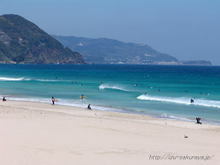 When I went to Shimoda for shopping I took pictures on the beach. 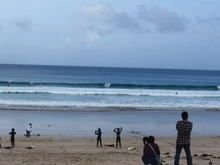 Since April 19th the surfing competition of Japan has been taking place in Shirahama. 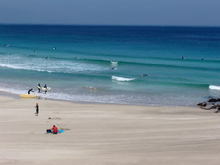 Shirahama beach is very famous for the spot of surfing in Japan, so many competitions are taken place here every year. On the 1st day, as they had a bad condition for surfing in Shirahama they moved to Tatado beach where they had better waves than Shirahama…. This entry was posted in beach on 2007年4月21日 by izusakuraya. Yes, today’s beach was gorgeous !! Last night the weather forcast said, "It will be alomost cloudy and sometimes rainny." However today’s Shirahama had a very beautiful and gorgeous sea. Don’t you think that it seemed like a beach in Okinawa ? As it was very hot I put on only shirt at last. Yes, I could already feel a summer would be coming. Every GW a lot of people come to this beach to swim, but they will be able to do it this year too!! This entry was posted in beach on 2007年4月14日 by izusakuraya. Gods from The Sky with Spotlight …. They had clouds in the sky this morning, and the sun was hidden by these clouds. But when I was looking at the sky the light of sun started to come down from the hole of clounds. It looked like a spotlight on the stage. Yes, the gods were coming from the sky ….. 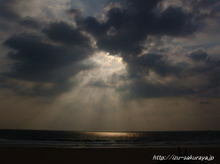 This entry was posted in beach on 2007年4月12日 by izusakuraya. In Sakura season the weather is changing day and day. So it was sunny today after some days in Shimoda. When my son, Yuuki got into the beach he started to run around on the beach soon. I understand that he was very happy and comfortable in a big field….. 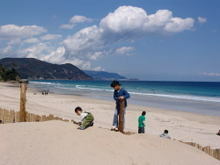 This entry was posted in beach, Family on 2007年4月4日 by izusakuraya.